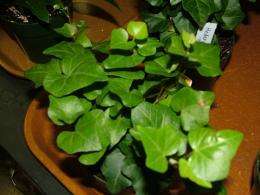 (PhysOrg.com) -- Some plants have the ability to drastically reduce levels of indoor pollutants, according to new research at the University of Georgia. Researchers showed that certain species can effectively remove air-borne contaminants, including harmful volatile organic compounds, suggesting a critical new role for plants in home and office environments. 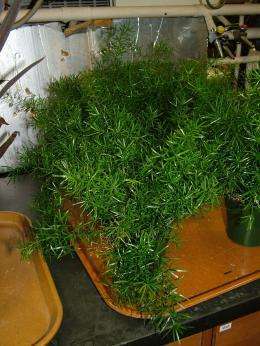 Of the 28 plants tested, researchers identified five “super ornamentals”—those that had the highest rates of contaminant removal, a process called phytoremediation. 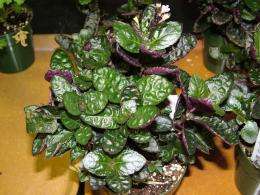 These include the purple waffle plant (Hemigraphis alternataa), English ivy (Hedera Helix), variegated wax plant (Hoya cornosa), Asparagus fern (Asparagus densiflorus) and the Purple heart plant (Tradescantia pallida). Placed in glass, gas-tight containers, the plants were exposed to a number of common household VOCs, including benzene, toluene, octane, alpha-pinene and TCE. The work, funded by UGA’s Agricultural Experiment Stations, was published in the August 2009 issue of HortScience. In fact, harmful indoor air pollutants can cause a host of serious illnesses, including asthma, cancer, reproductive and neurological disorders—and more than 1.6 million deaths a year, according to a 2002 World Health Organization report. The VOCs emanate from furnishings, carpets, plastics, cleaning products, building materials like drywall, paint, solvents and adhesives. Even tap water can be a source of VOCs. The air inside homes and offices is often a concentrated source of these pollutants, in some cases up to 100 times more polluted than outdoor air, according to research. Not all VOCs are toxic, and plants themselves emit some VOCs, though most appear not to be toxic, at least at normal exposure levels. But Kays said a lack of information about chemical toxicity—and an affordable method for measuring interior air quality—makes assessing their presence and safety more difficult. Fifty million organic and inorganic chemicals are now registered in the CAS system, a registry that includes chemical substances identified since 1957. Probing Question: Is indoor air pollution really a problem? I believe it's Hoya carnosa, not cornosa.